← Schlemiel on a Wheel, Schmuck on a Truck, Schnorrer on a Menorah, etc. Sockets are instant candleholders. And a socket holder is an instant Hanukkah menorah base. 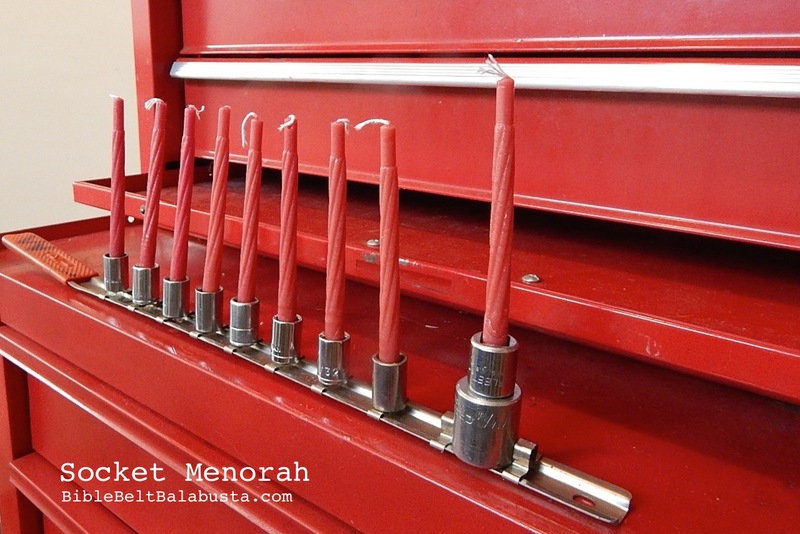 Thus, the Socket Menorah: instant ritual object for the handyperson or car nut. Thanks to generous hand-me-downs, sockets are considered found material at my house, so I classify this DIY as an upcycle, recycle, repurpose and even scrap art. However, no socket was harmed in the making or use of this menorah. When I light it, I’ll use disposable bobeches to catch the drips, else wax will clog the interiors. After the holiday, each socket will snug back into its unique hole in the original container, Montessori-style. Should sockets not be underfoot at your house, one set will suffice, and honestly, everyone needs at least one. (Harbor Freight is my favorite cheap chain, fyi. I swoon amongst the anvils and pliers. And oh, the COUPONS.) The candleholders culled from one set will necessarily be of graduated internal dimensions, and sometimes external as well. If the latter, they will bring a different yet pleasing aesthetic to an instant garage menorah. They can work themselves upward to the 8th night. The Talmud tells us to “increase our joy” by adding lights, and you will be increasing height as well. The Talmud also tells us to keep the 8 lights level, but I am confident you can figure out a solution. SIZE MATTERS: for ordinary Hanukkah candles, my 5/16, 13/32, 11/32, 3/8 and 9mm sockets work well, and stars are more secure than hexes. Bigger sockets would benefit from a tiny wad of foil or the aforementioned bobeche. If your sockets are 3/8″ (rather than 1/4″), then that 3/8″ driver hole will hold a candle nicely, and you can arrange your sockets upside down. In which case, the menorah won’t attach to a socket holder, but can be modular instead. This entry was posted in Crafts, Hanukkah, Kitsch and tagged hardware, menorah. Bookmark the permalink. Joanna, you are totally amazing!!!! I love following your posts and on FB. So creative and you write them up in wonderful style!!! BRAVO. Thank you! I love that you read my stuff. Makes me feel like you aren’t so far away. I love the hardware store for craft inspiration!! !